The two day National Conference on "Recent Advances in Experimental and Theoretical Physics (RAETP-2018)", organized by Department of Physics and Astronomical Sciences, Central University of Jammu concludes today at CU Jammu. This conference was sponsored by Council of Scientific & Industrial Research (CSIR), Govt. 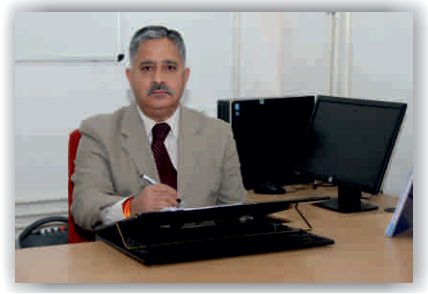 of India and Board of Research in Nuclear Sciences (BRNS) Department of Atomic Energy, Govt. of India. The conference involved technical sessions which began with Keynote address by Prof. H.C. Swart from University of the Free State, South Africa and Eminent academician of repute. The first day presentations were based on materials sciences, nanomaterials, materials modification by ion beam, and other advance characterization techniques. Prof. Ravi Kumar (NIT Hamirpur) presented a wonderful insight on the origin of spintronics in his invited talk on “Materials Engineering for Spintronics applications”. He also recalled the contribution of eminent physicists and noble laureates and motivated the young scientists to achieve excellence. It was followed by the talk of Prof. Mahavir Singh on “Role of magnetic Nano particles in the ultra high frequency region”. Dr. Fouran Singh (IUAC, New Delhi) spoke on “Tailoring of band gap in oxide semiconductors: effects of doping, annealing and swift heavy ion irradiation”. Second day was devoted on themes; nuclear physics, material modifications solid state lighting, etc. A total of 112 Research paper were presented, 17 invited talks and 12 oral presentations were delivered by eminent speakers and academicians and research scholars in this conference. On second day the first technical session was chaired by Prof. S. K. Khosa. Prof. R. K. Shivpuri, delivered an invited talk on “Discovery of God Particle and the Origin of Universe”. It was followed by an invited talk by Dr. Vikram Singh from Central University of Himachal Pradesh who spoke on “Higher order organization in bidirectional biological networks”. Prof. S. K. Gupta from BARC, Mumbai enlighten the audience with Development and analysis of organic field effect transistor based gas sensors. Dr A. K. Bedyal, University of the Free State, South Africa gave an overview on the Luminescence Response of Alkali-Alkaline Based Oxide Phosphors for Solid State Lighting. Dr. Sandeep Arya from University of Jammu, in his presentation explained the “Synthesis of Nanostructured Materials via Template-Assisted Electrodeposition. The invited speakers were felicitated at the end of each talk. Prof. Arun Bharti, Dr. Lalit Kumar Saini and Dr. Fouran Singh chaired the poster sessions. All official sponsors Agilent India, Toshvin Pvt Ltd, Scientech and Ramesh Traders Jammu were also honored by Convener, Dr. Vinay Kumar. He also thanks the untiring efforts of the organizing team of RAETP-2018: Prof. S. K. Khosa (coordinator), Dr. Avinash C Yadav(Co-convener), Dr. Amit Tomar and Suram Singh (Organizing Secretary), Dr. Jehova Jire (Joint Secretary) to make this as a mega event of the Department. Dr. Amit Tomar, Organizing Secretary, summarized the report in the function.